please visit http://www.galaxyofart.wordpress.com to continue reading about the very interesting artists of this planet! I wanted to mention that to continue reading about the fun world of art please visit my new site at http://www.galaxyofart.wordpress.com. I have used the file storage limit on this site! Thanks again for reading! Three brothers from Minnesota won the first, second, and third places in the United States Federal Duck Stamp competition. The artists don’t receive any cash prizes, but make money from selling prints of the stamps. The brothers are very successful as a businessman as their works appears on many decorative items found around the house including towels, blankets, and curtains. 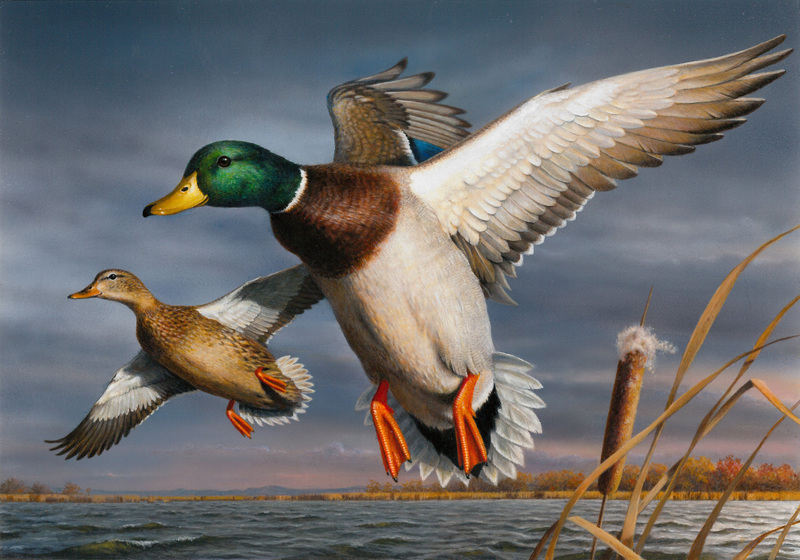 Below is the first place painting of the 2015 Duck Stamp competition by Joseph Hautman. 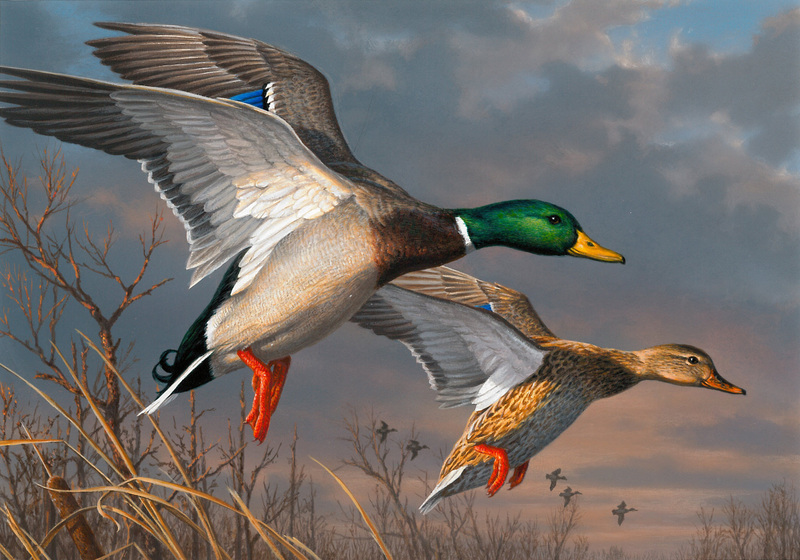 The trio has won the Federal Duck Stamp competition a total of ten times. Below a link to the website featuring Duck Stamp works. As a group their art has appeared on more than 50 stamps! The brothers work with acrylic paint. 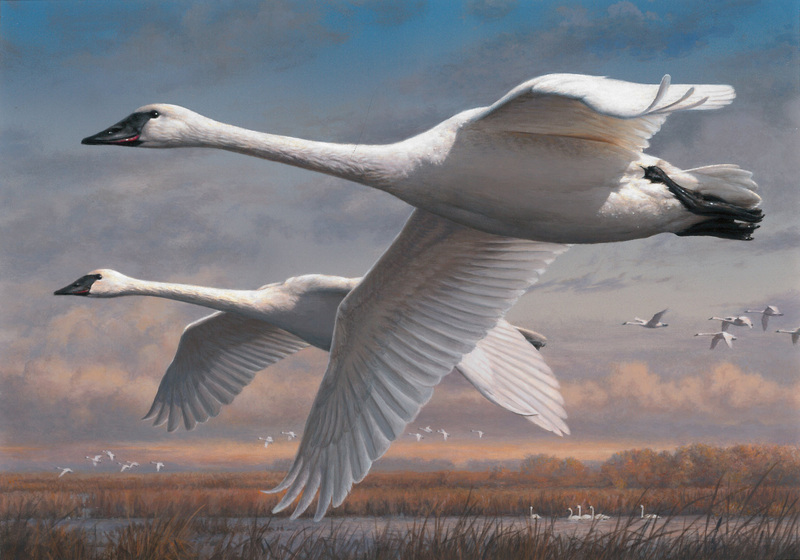 Below the second place finisher in the 2015 Duck Stamp competition, Robert Hautman. Price range information: Prints of the winning artwork can be found for $250. What a great family of artists! Its great to see artists doing well as businessman, but also helping to raise money for waterfowl conservation. And to close the third place finisher in the annual competition, James Hautman. Dabs and Myla are one of few husband and wife street artist teams. The couple grew up in Australia, both spent much time living in Melbourne. Dabs and Myla are now based out of Los Angeles, California after relocating to the city in 2009. Recently the couple was chosen to design the logo for the 2015 MTV Movie Awards Logo. Whats great about this duo is that they have loads of fun when they create! One can’t help but smile at some of their cartoon compositions. Mehdi Ghadyanloo is an contemporary Iranian street artist renown his Op Art style. Mehdi Ghadyanloo was born in Karaj, Iran in the year 1981. Ghadyanloo worked as a farmer before attending college at the University of Tehran where he studied painting. The artist went on to earn a masters degree in animation from Tarbiat Modares University. The artist had his first solo exhibition in London, England in 2015. Ghadyanloo has a wonderful sense of design. The artist uses a great mix of organic and geometric shapes that really make his work grab the viewer’s eye. Lady Aiko is an internationally renown street artist from Japan. Lady Aiko was born in Tokyo, Japan. The artist attended college at Tokyo Zokei University where she studied filmmaking and graphics design. Lady Aiko went on to earn an M.F.A. from the New School located in New York City. After college the artist worked with Japan’s version of Andy Warhol, Takashi Murikami. The artist has also worked with the street legend Banksy, taking pictures of the artist whilst Banksy made unauthorized installations at the Museum of Modern Art located in New York City. She has also worked with the group F.A.I.LE. Although the artist Banksy calls street art a movement featuring few females some other great female street artists include Faith 47, Swoon, Maya Hayuk, and Miss Van. Cody Hooper is a fantastic American abstract artist. Cody Hooper was born in Perrytown, Texas in the year 1978. Hooper studied with watercolorist Barbara Hughes for many years. With Hughes he learned the basics of watercolor, design, and how to get different textures on his painting surfaces. During the past few years Hooper has become an abstract painter. The artist is always looking to other forms of art for inspiration. Hooper is based out of Sante Fe, New Mexico. David Simpson is an American abstract painter. David Simpson was born in Pasadena, California in the year 1928. Simpson attended the California School of Fine Art. (The school is now called the San Francisco Art Institute.) Simpson went on to earn a M.F.A. from San Francisco State College. The artist taught at the collegiate level at the University of California Berkeley. Simpson is now based out of Berkley, California. The artist has exhibited his work at the Museum of Modern Art located in New York City. Simpson sometimes uses acrylics and metallic based paints which gives a wonderful shimmering effect of light in his work. Tomory Dodge is an American painter renown for his very large abstract paintings. Tomory Dodge was born in Denver, Colorado in the year 1974. Dodge attended the Rhode Island School of Design located in Providence, Rhode Island earning a B.F.A in painting. The artist went on to earn a M.F.A. from the California Institute of the Arts located in Valencia, California. Dodge was given a grant as an M.F.A. student from the Joan Mitchell Foundation. Dodge is now based out of Los Angeles, California. Tomory Dodge has created a wonderful and more abstract style in his later works. His later works with their bold and thick paint might appear as if the just created them spontaneously, but most of his large scale works takes months of painting to complete. John Dubrow is an American Impressionist painter renown for his work with the figure. John Dubrow was born in Salem, Massachusetts in the year 1958. Dubrow attended Syracuse University located in New York City. He also studied in London, England at the Camberwell College of Arts for one year. Dubrow went on to earn a B.F.A. and M.F.A. from the San Francisco Art Institute. Dubrow was influenced by the Bay Area Figure painters. The artist that influenced him the most was Richard Diebenkorn. When Dubrow paints a portrait he first sketches it on his Ipad. Dubrow was made a member of the National Academy of Design in 1999. Dubrow does a great job at using a variety of basic geometric shapes in his landscapes.